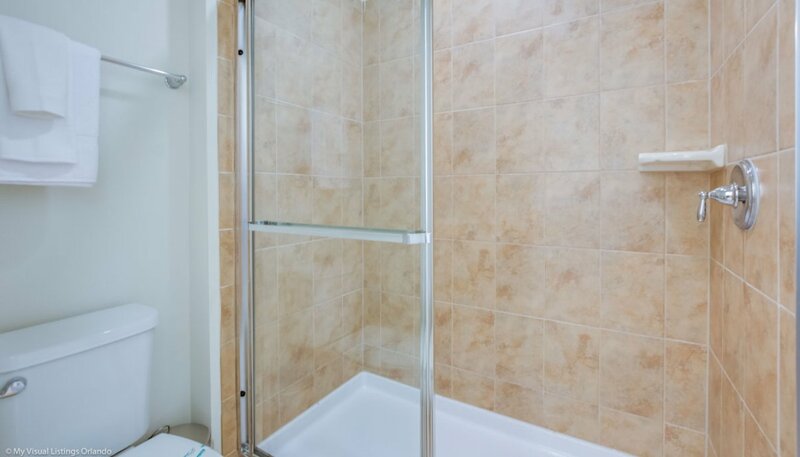 As you enter the villa you are greated with a fabulous tiled hallway leading off to bedroom 8 & family bathroom 6 on the right. 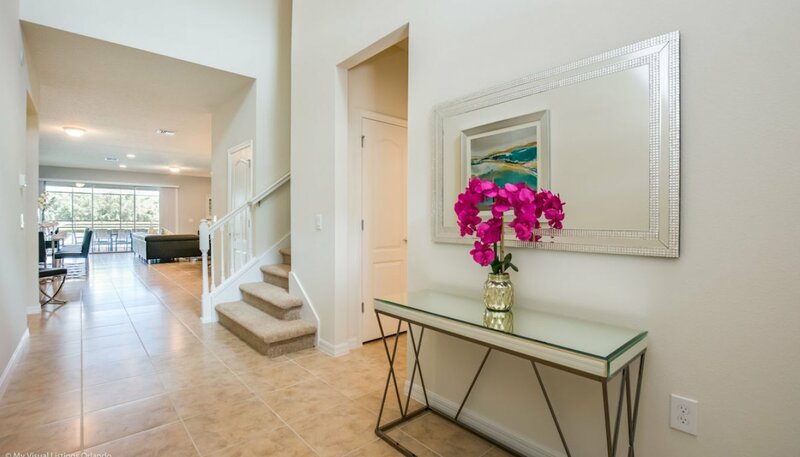 Then you find the stairs leading to the main bedrooms. 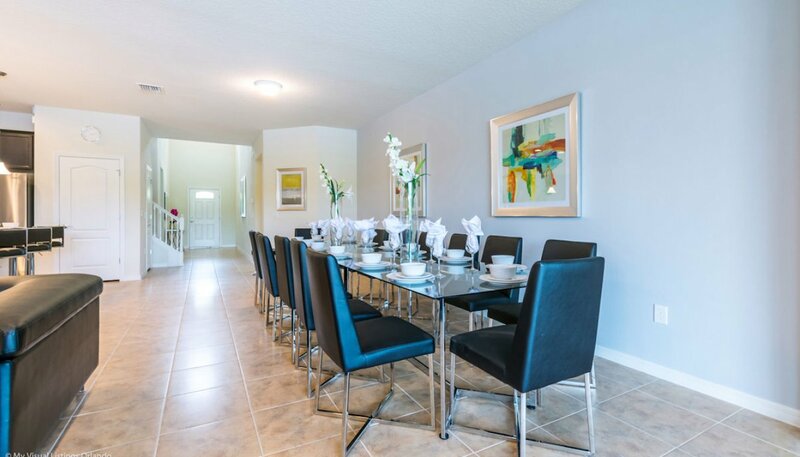 Finally the hallway leads to the spectacularly open plan living space with dining area, family room and kitchen - real WOW factor !! 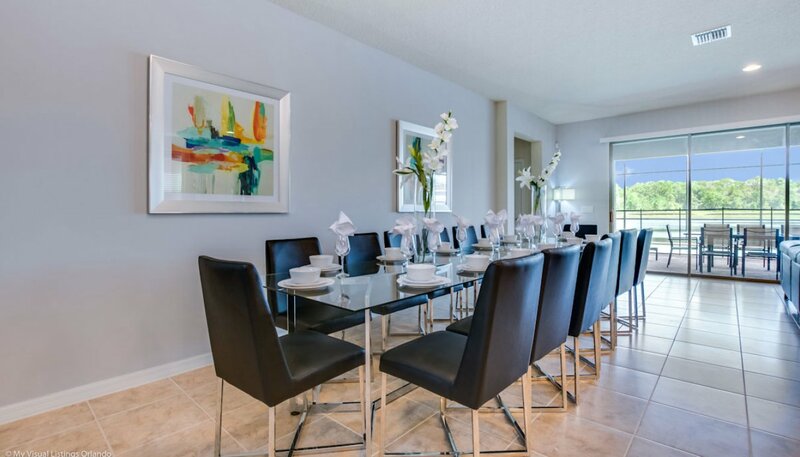 Adjacent to the family room is the beautifully decorated dining area with large glass topped chrome dining table with 14 chairs and is ideal for large parties and formal dining. 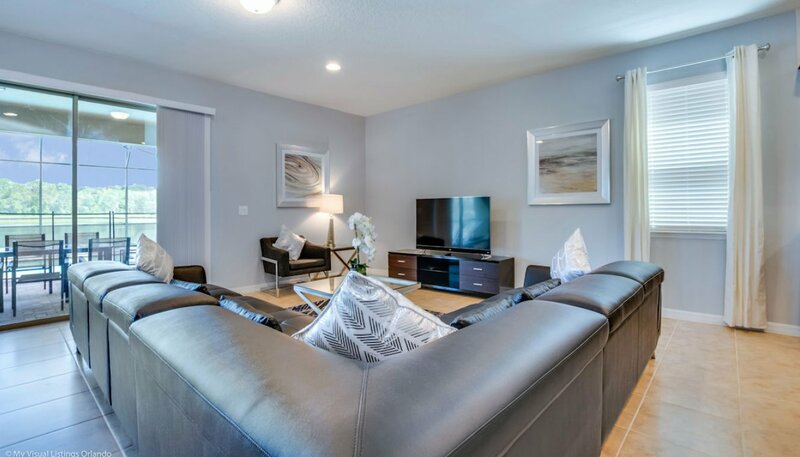 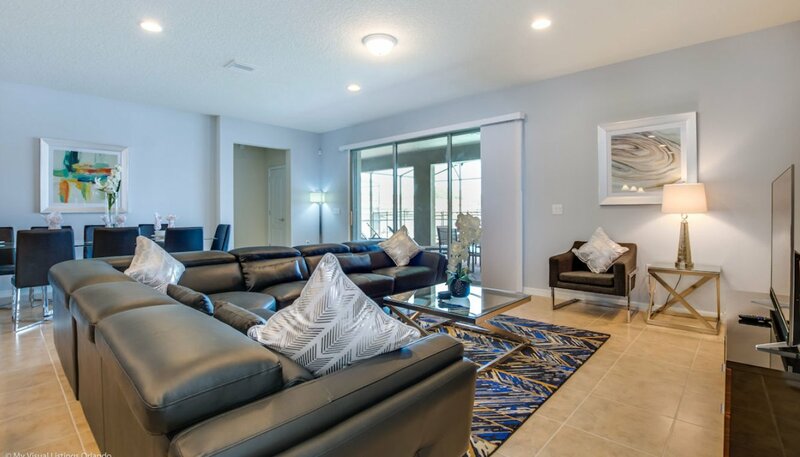 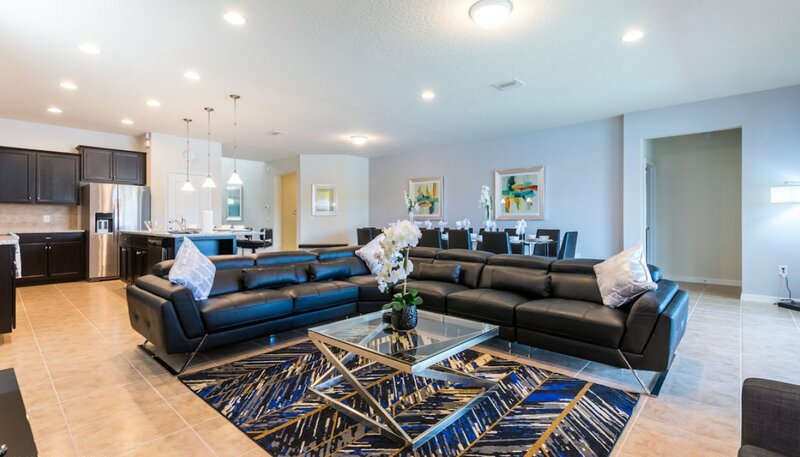 The contemporary style family room with direct access & views to pool deck offers comfortable leather sectional sofa set and armchair for you to relax and watch the large LCD cable TV. 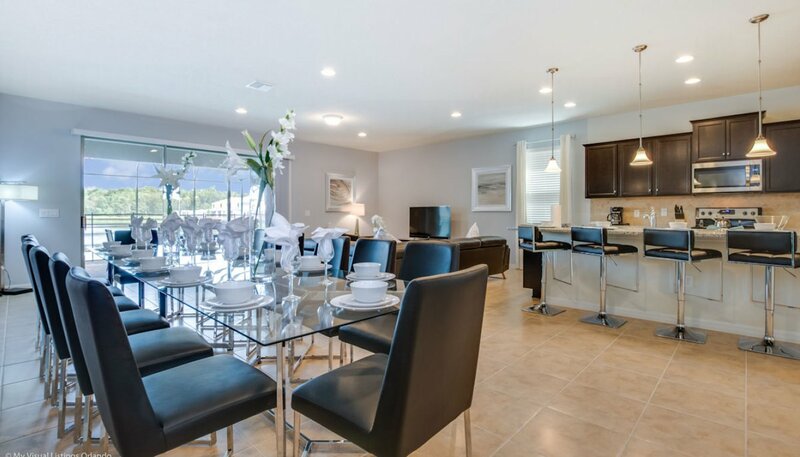 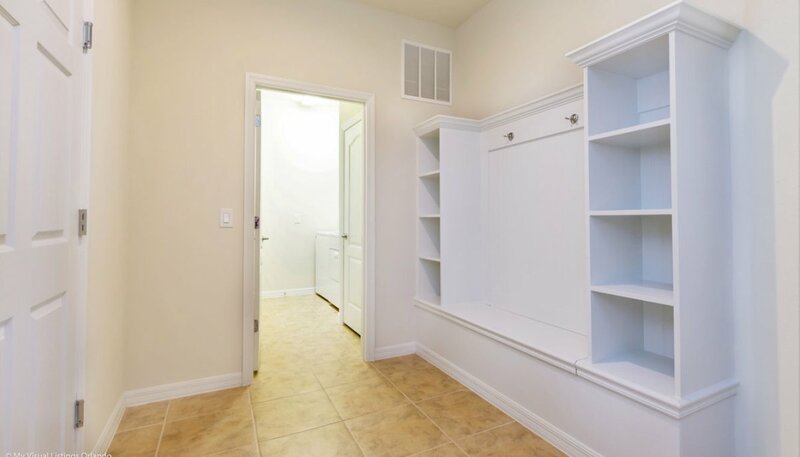 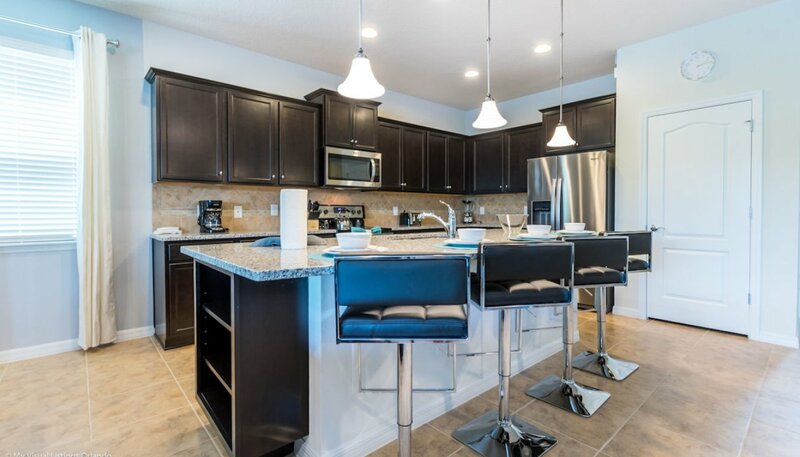 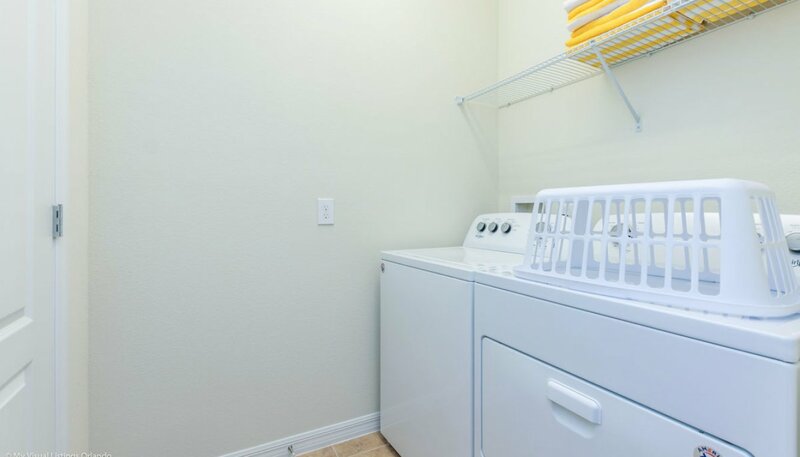 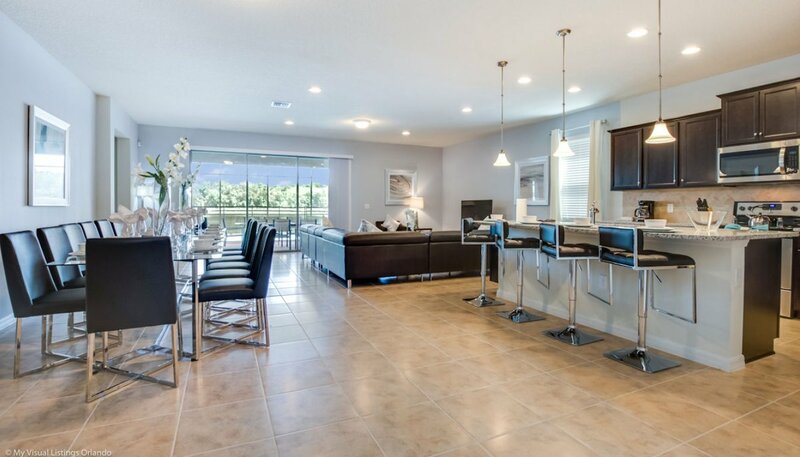 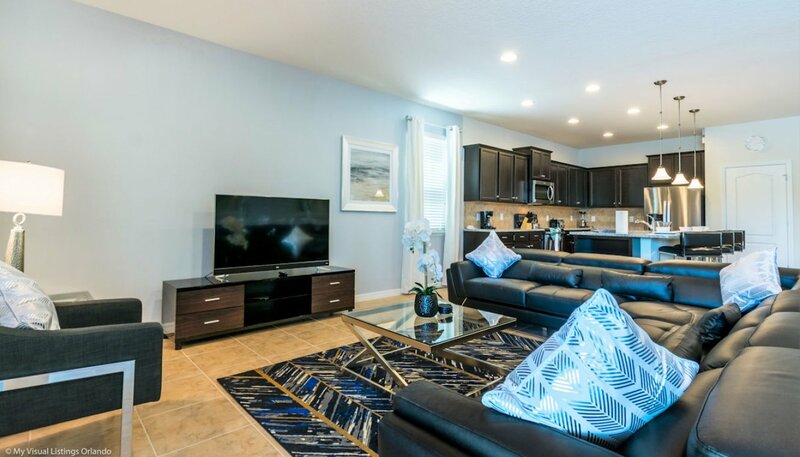 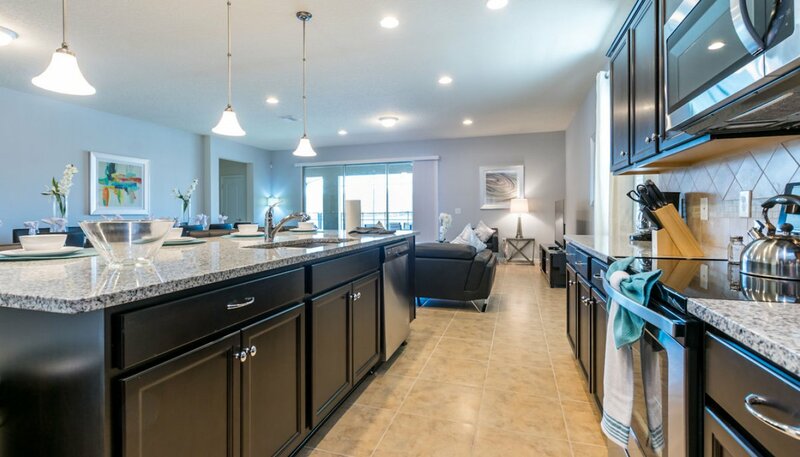 Luxury kitchen with granite countertops and stainless steel appliances, and has all the amenities including dishwasher, stove with oven, microwave, refrigerator & freezer with automatic water and ice dispenser, waste disposal, coffee maker, blender, toaster & kettle. 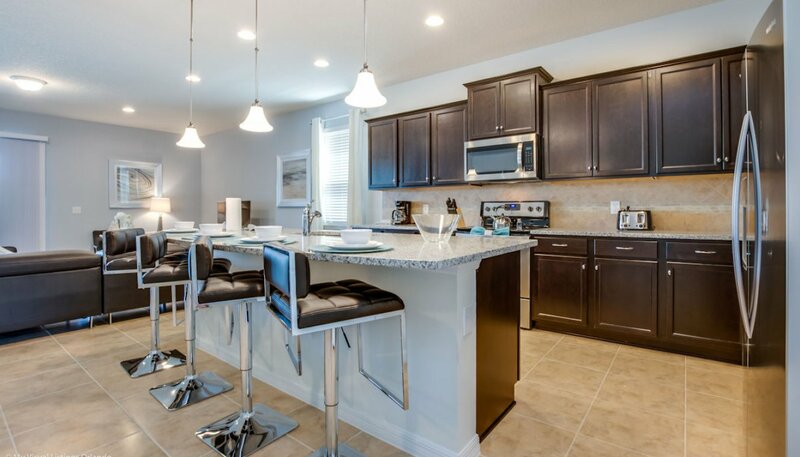 The breakfast bar offers seating for 4 on comfortable bar stools. 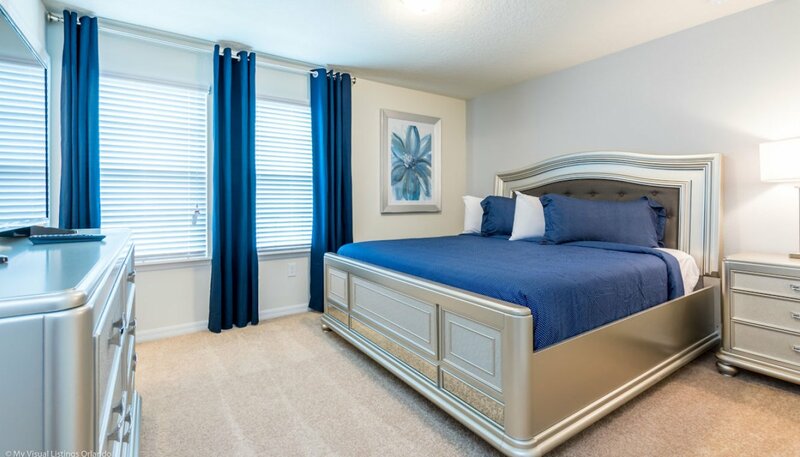 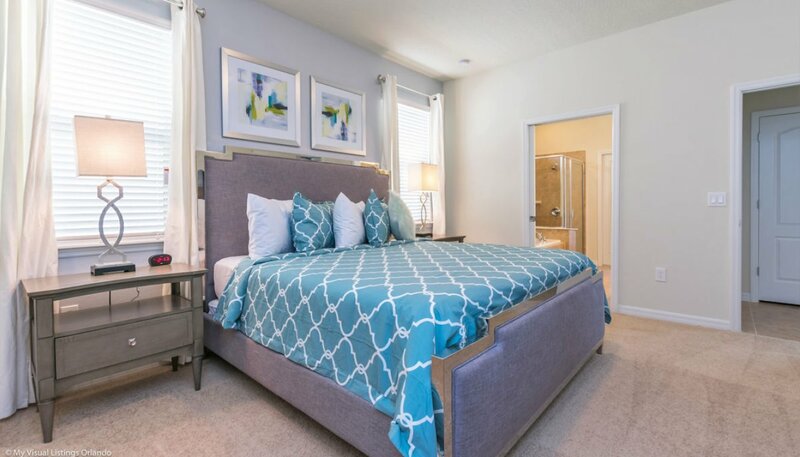 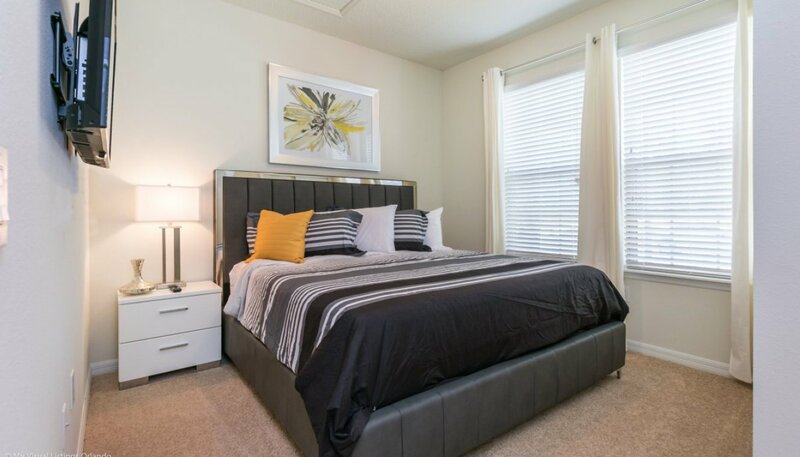 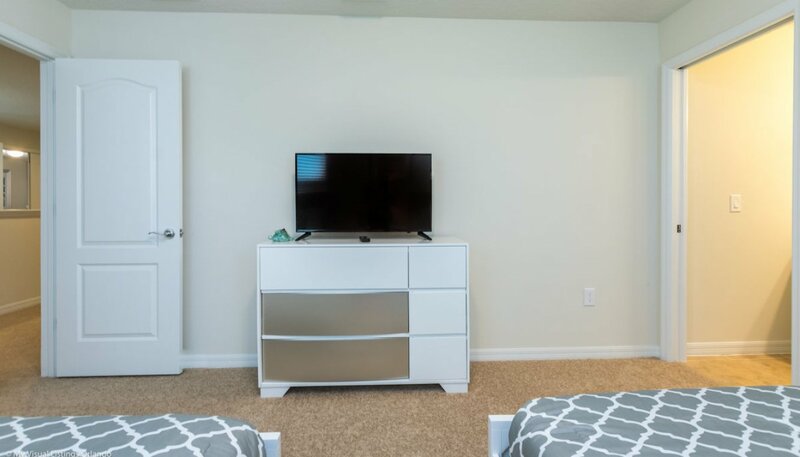 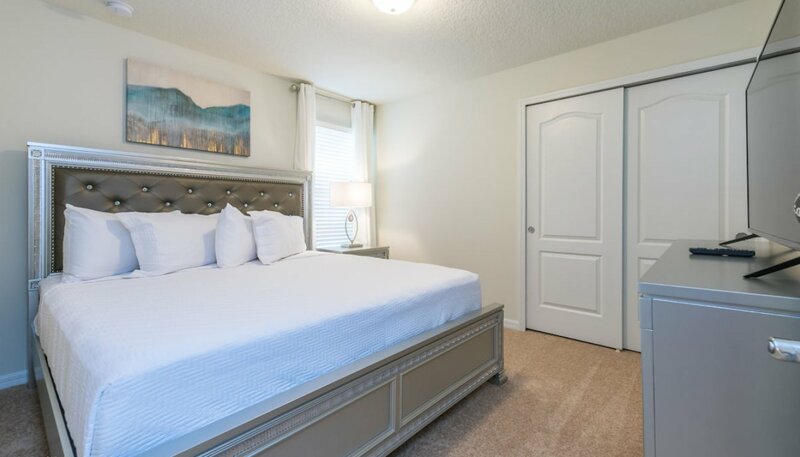 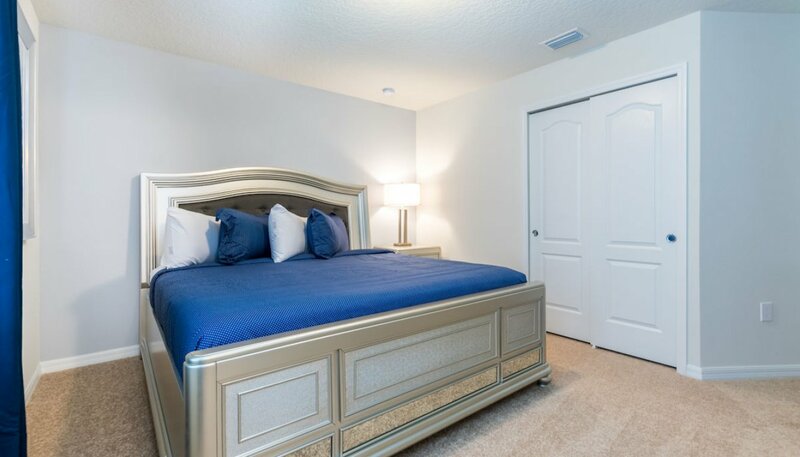 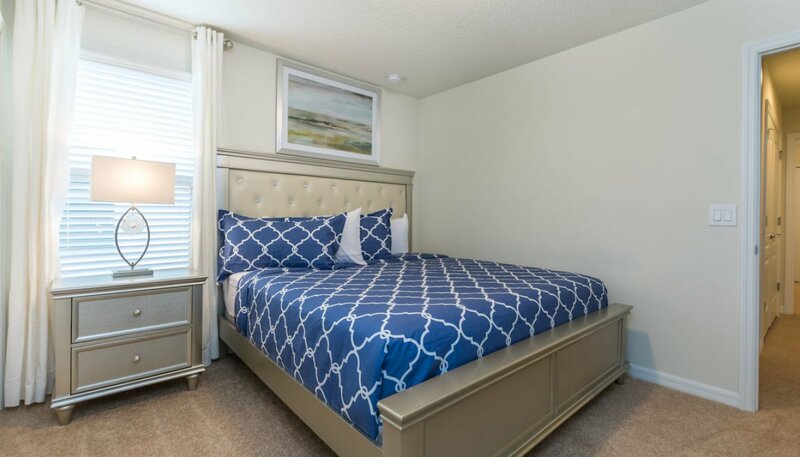 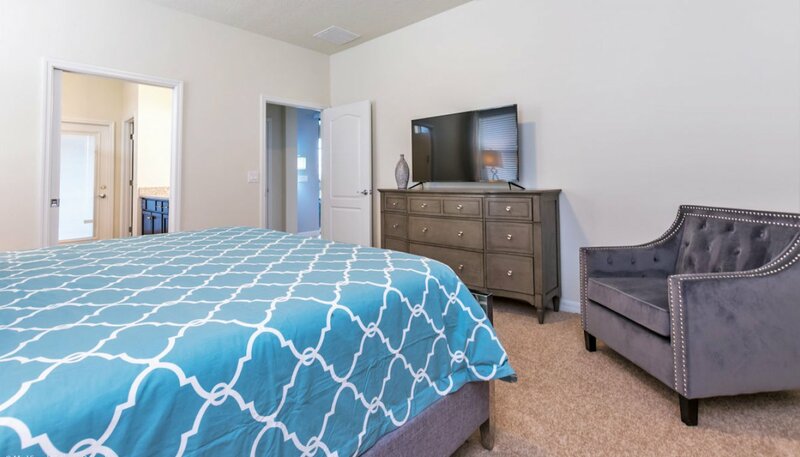 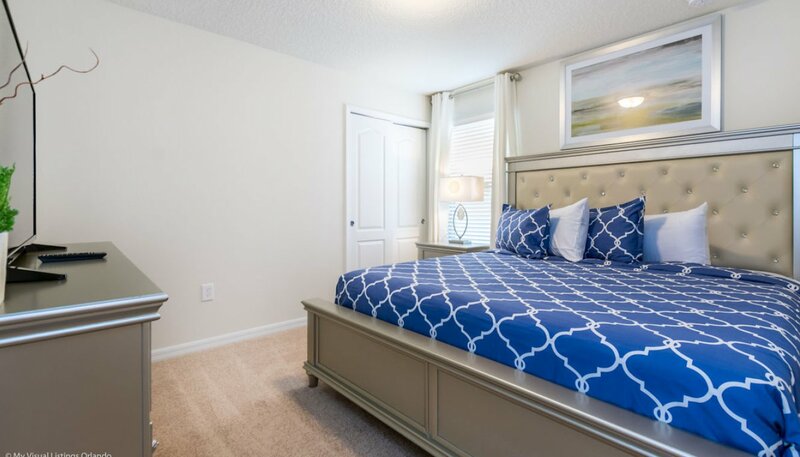 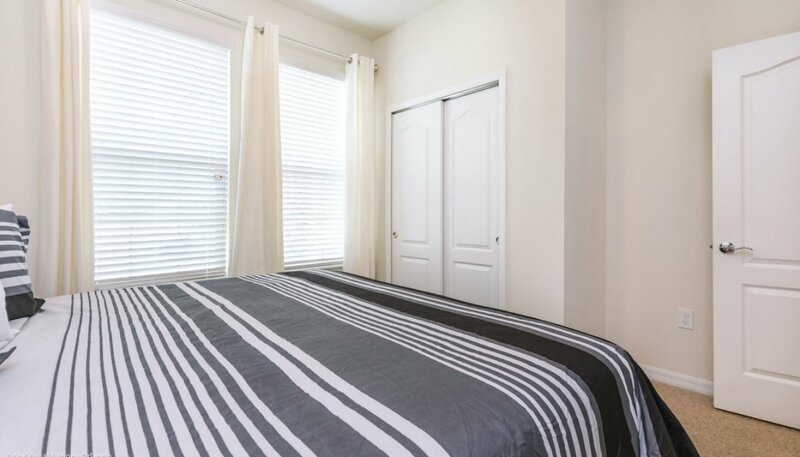 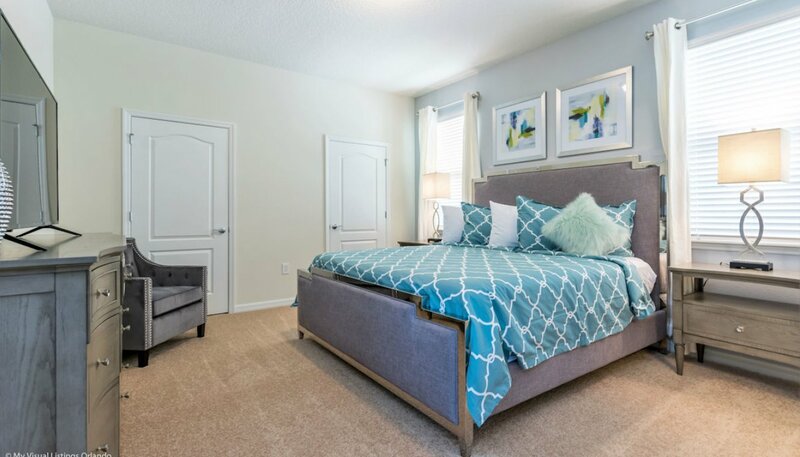 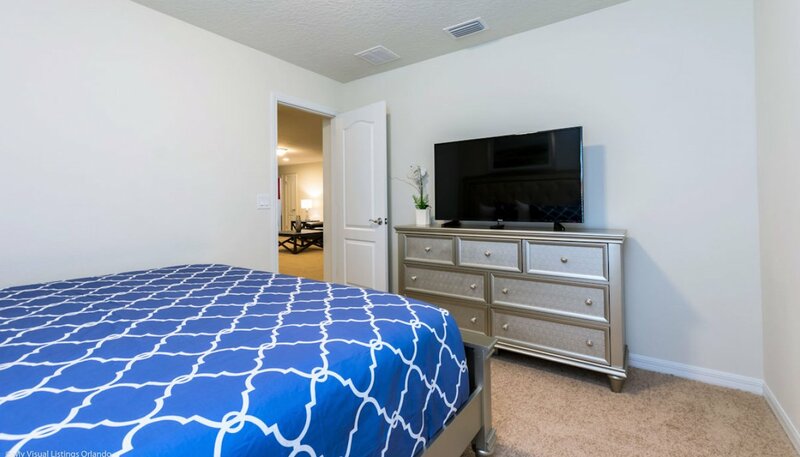 The large master bedroom has been furnished with a king sized bed, matching nightstands, chest of drawers with large LCD cable TV above, alarm clock and 2 x walk-in wardrobes. 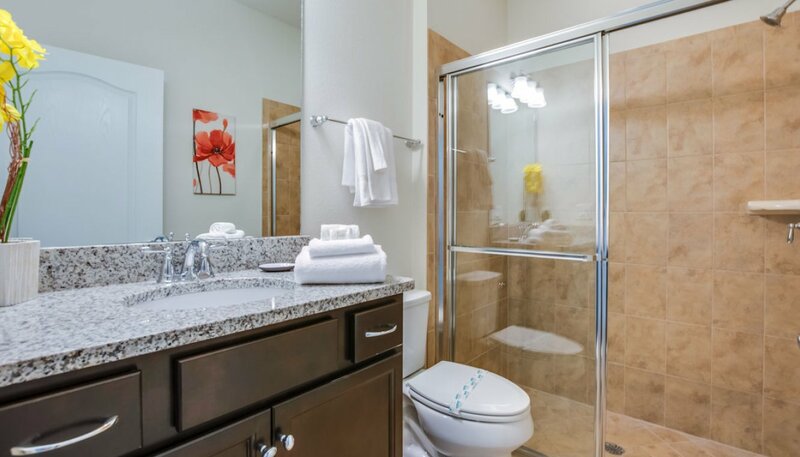 The connecting spacious ensuite bathroom has a bath, large walk-in shower, granite countertop with his & hers inset sinks and separate WC. 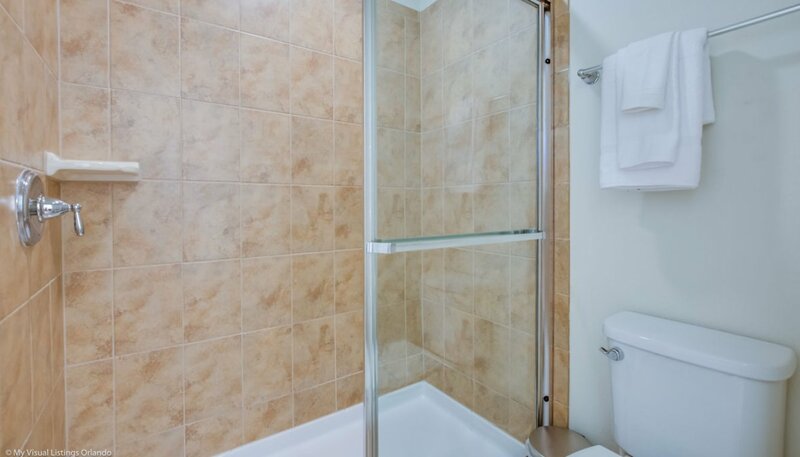 This bathroom also serves as the pool bathroom during the day whilst the pool is in use. 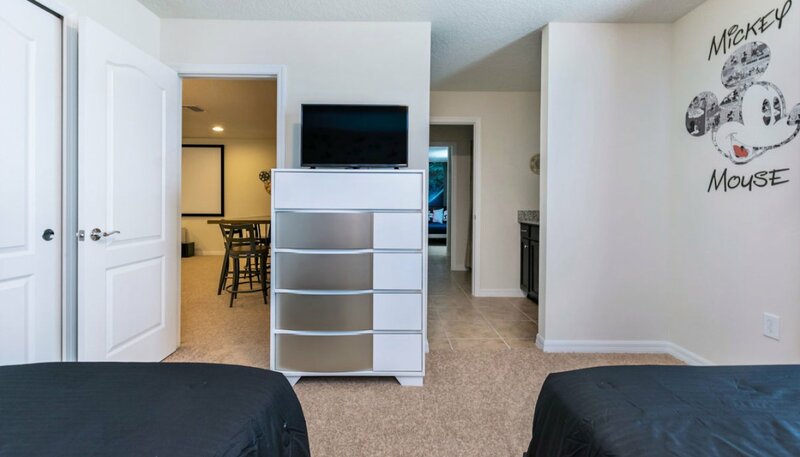 The ground floor bedroom has a queen sized bed with matching nightstand, chest of drawers with large LCD TV above and a built-in wardrobe. 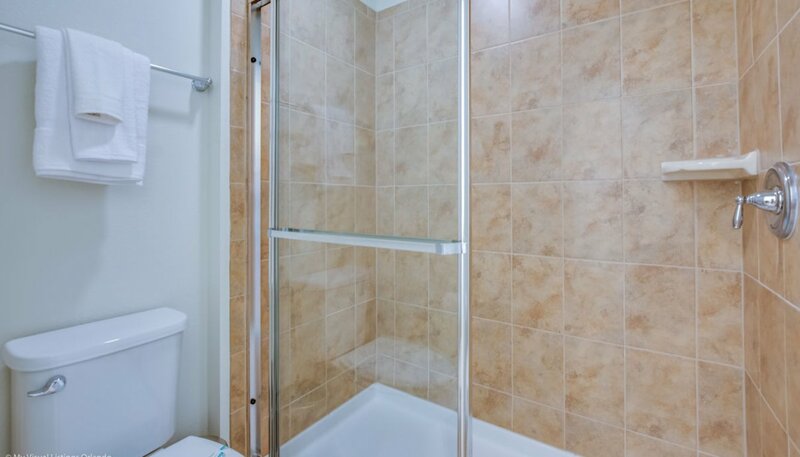 The ground floor bathroom has a walk-in shower, WC and built-in sink unit with granite countertop. 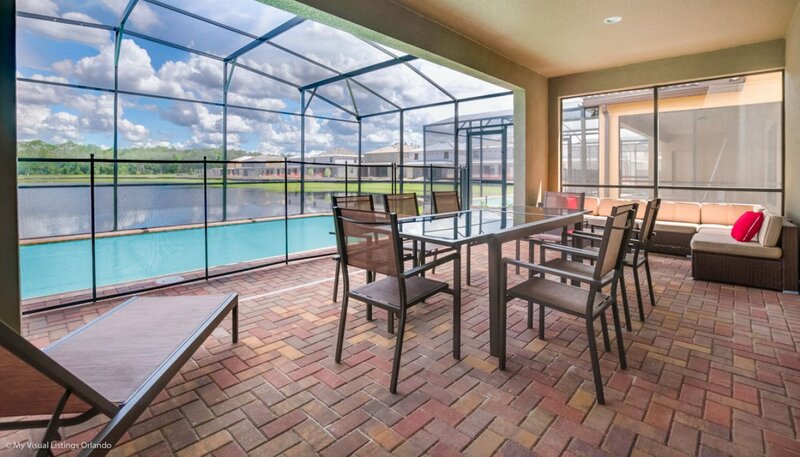 The large pool with east facing deck has unobstructed open lake views. 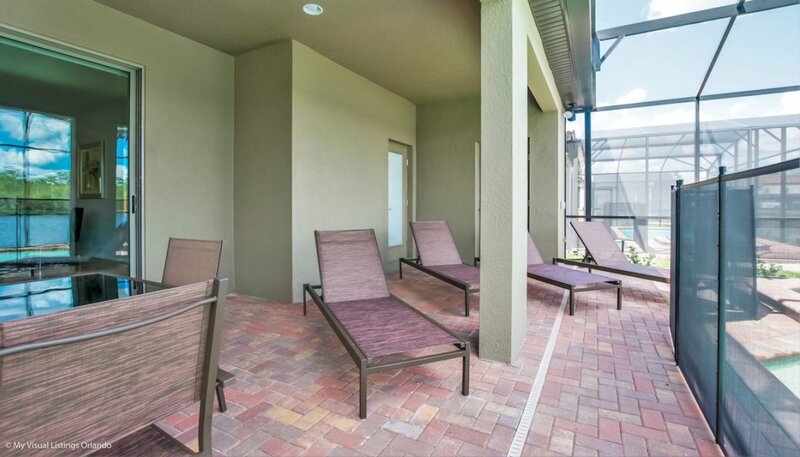 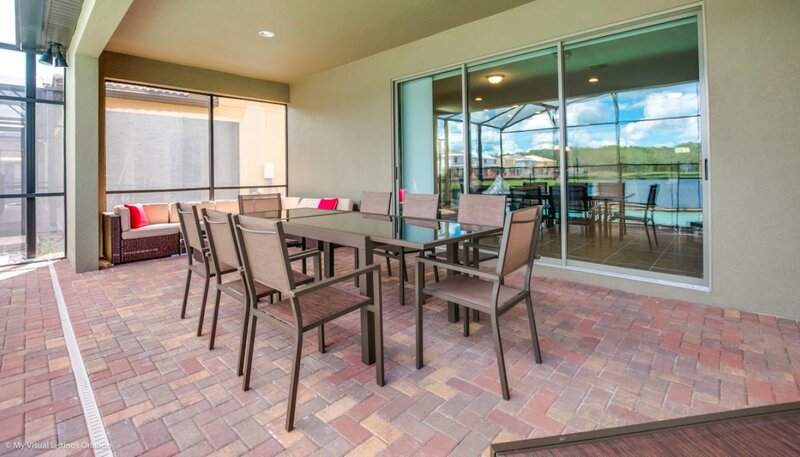 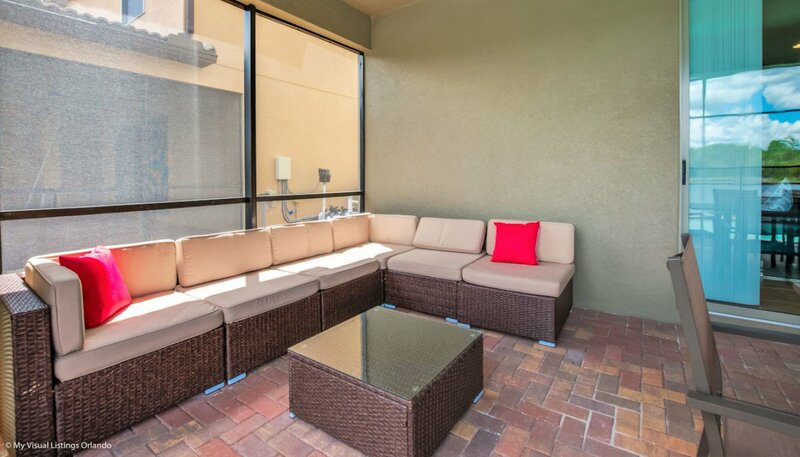 We have provided 4 sun loungers for your sunbathing comfort and a patio table with 8 chairs under the shady covered lanai. 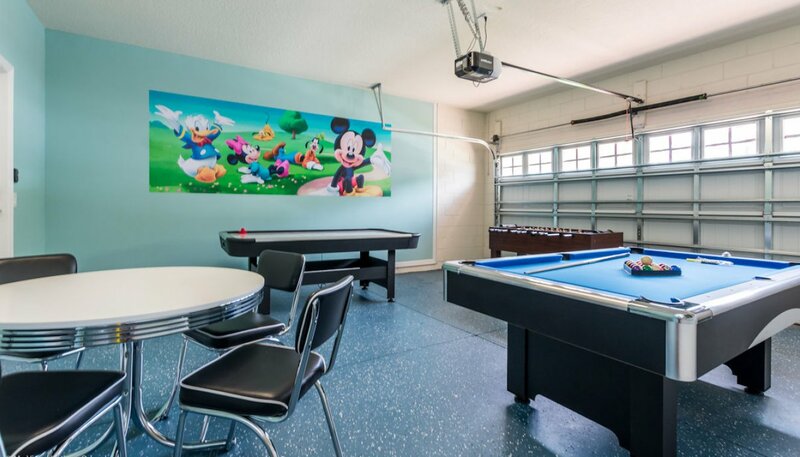 We have tried to include everything a young family could wish for in a holiday home such as a cot (crib), highchair, stroller, potty and baby monitor, which are all provided free of charge. 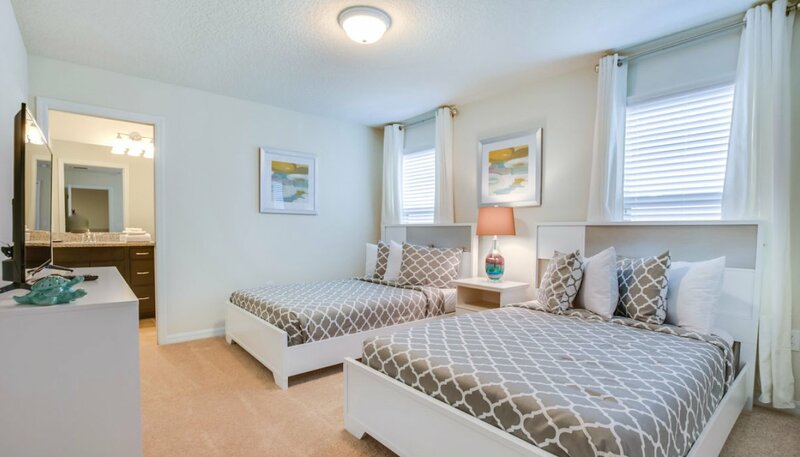 In addition for a toddler we have provided a Child Safety Bed Rail for use on any of the twin beds. 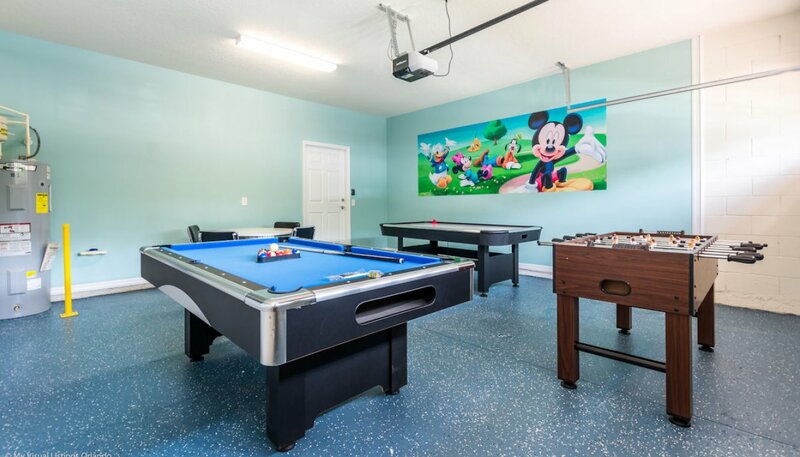 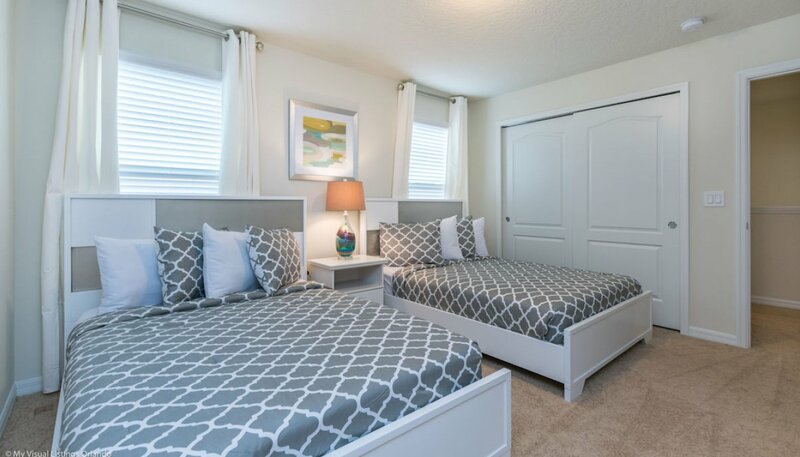 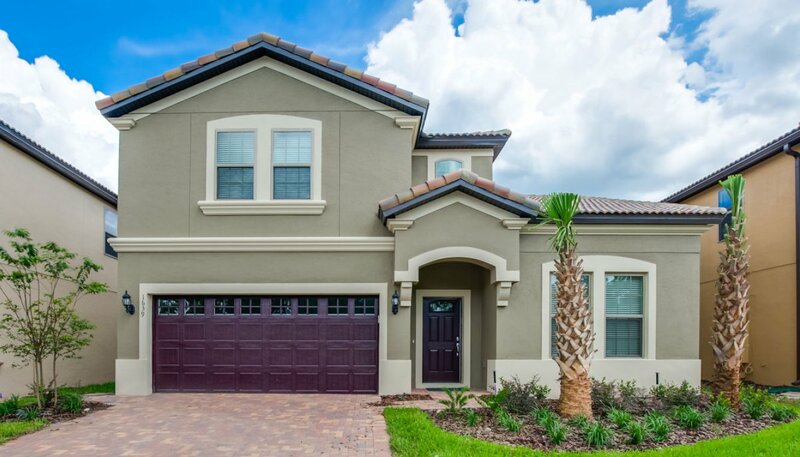 The excellent resort clubhouse with community pool and amazing facilities are literally just an 9-minute walk away. 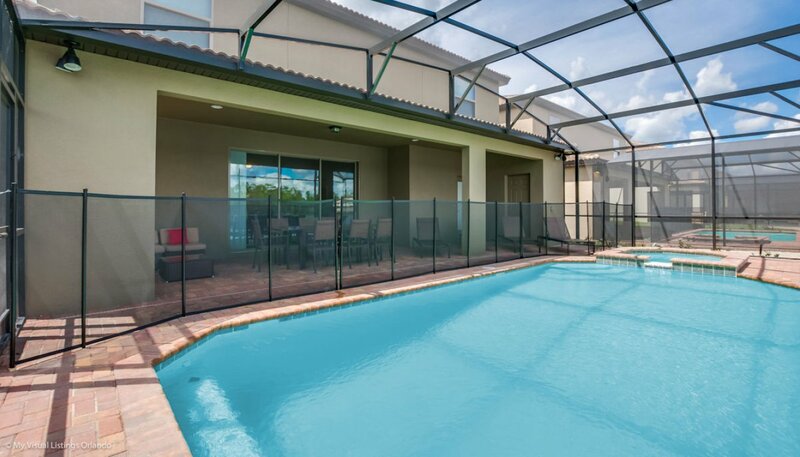 Alternatively 15 minutes north to the excellent selection of shops, bars & restaurants on the US192 at Orange Lake. 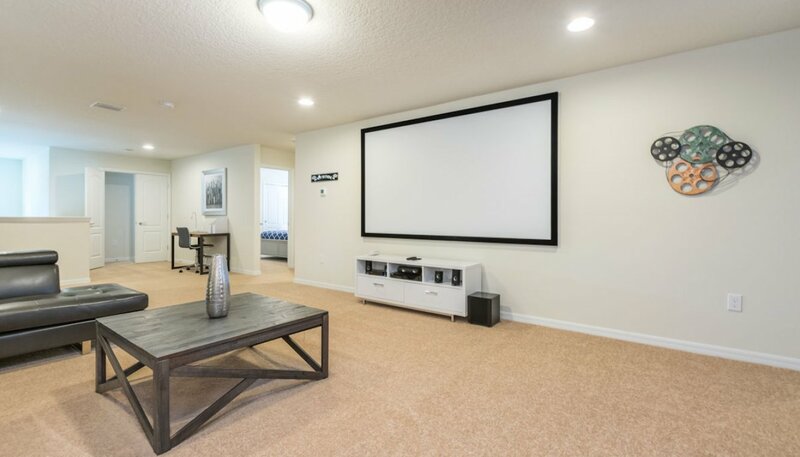 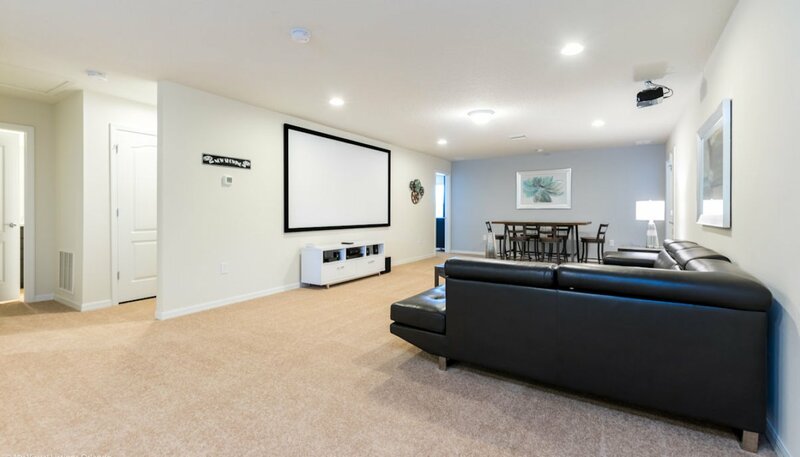 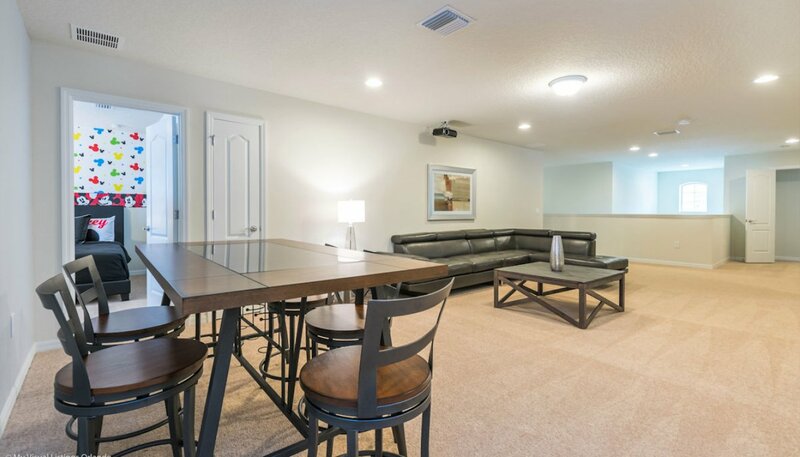 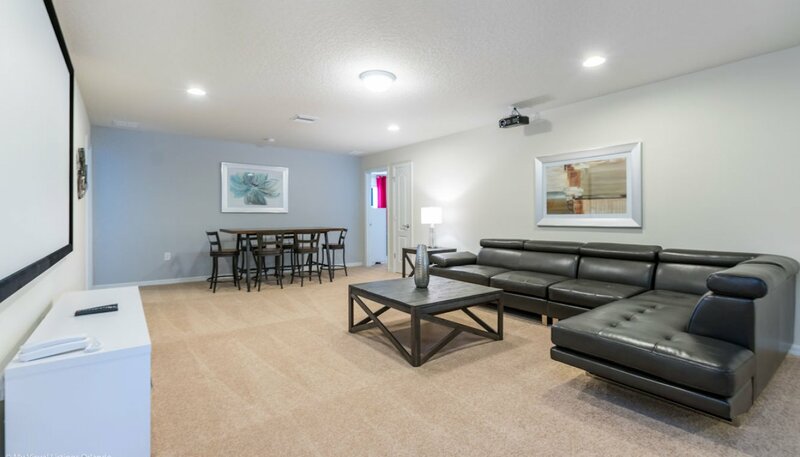 For your entertainment, there is a large loft space with a 100" projection TV with surround sound. 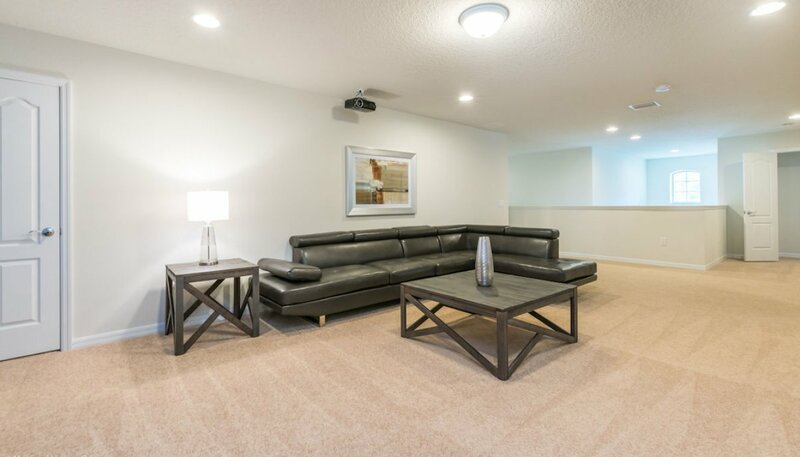 For your comfort there is an L-shaped leather sectional sofa for at least 8 persons. 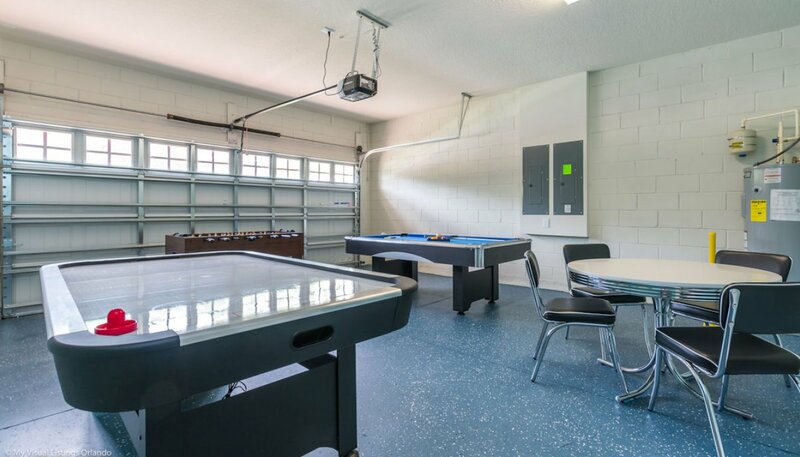 If you fancy a game of cards or a board game, there is a high-level table with 6 stools. 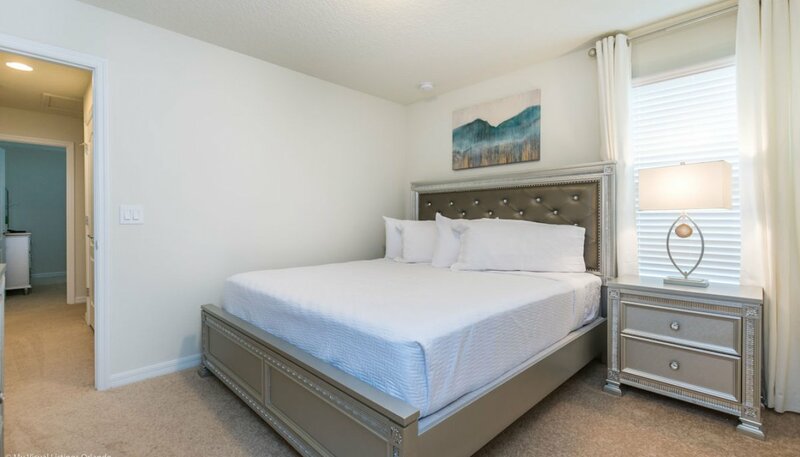 The second large master bedroom with its wonderful views over the front gardens has been furnished with a king sized bed, matching nightstand, chest of drawers with LCD cable Tv above and large built-in wardrobe. 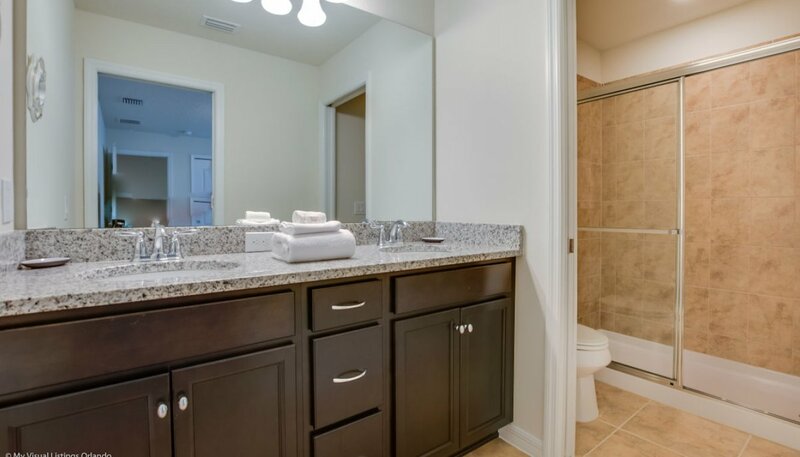 The connecting spacious ensuite bathroom has a walk-in double shower, his & hers vanity unit with granite countertop and WC. 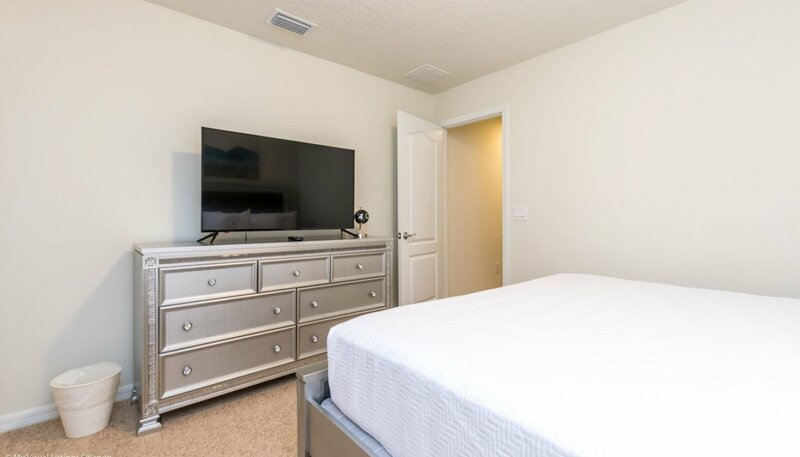 This bedroom has 2 full-sized beds, with matching nightstand, chest of drawers with LCD cable TV above and large built-in wardrobe. 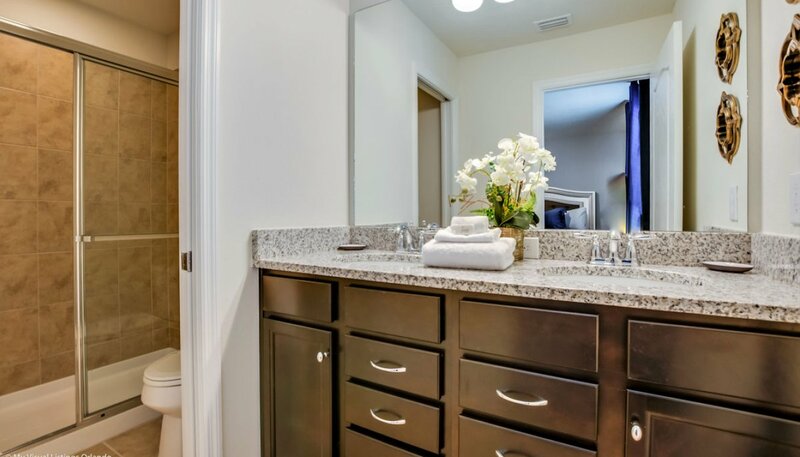 The ensuite bathroom with shower, his & hers vanity unit with granite countertop and WC. 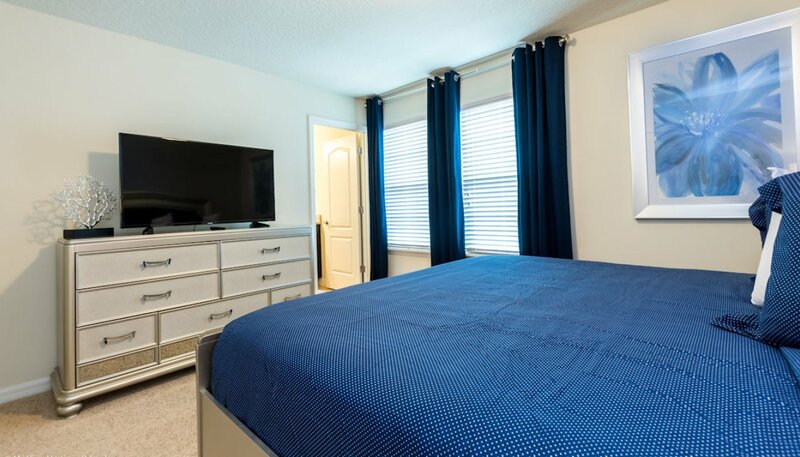 This Mickey & Minnie themed bedroom comes equipped with twin sized beds with a matching nightstand, chest of drawers with LCD TV above and large built-in wardrobe. 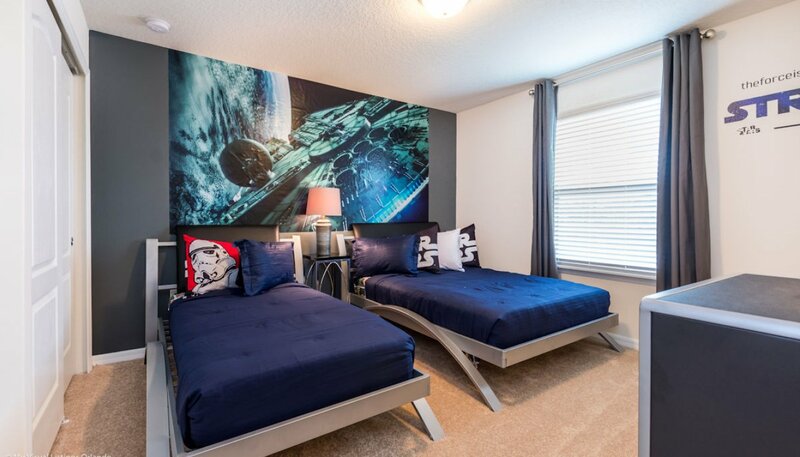 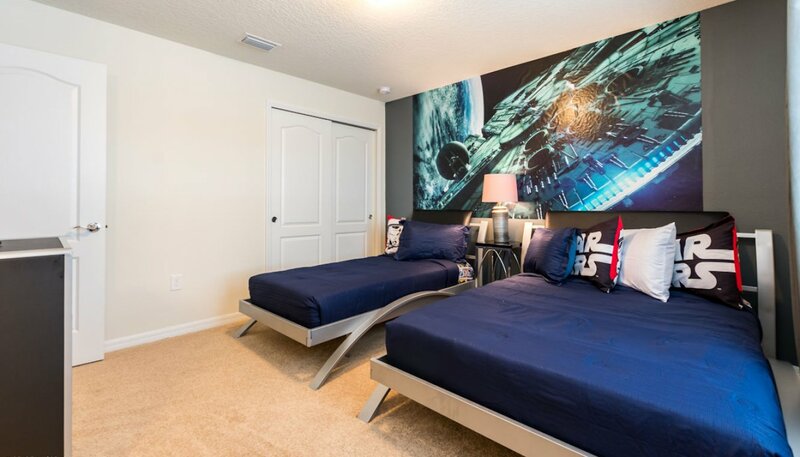 This Star Wars themed bedroom comes equipped with twin sized beds with a matching nightstand, chest of drawers with LCD TV above and large built-in wardrobe. 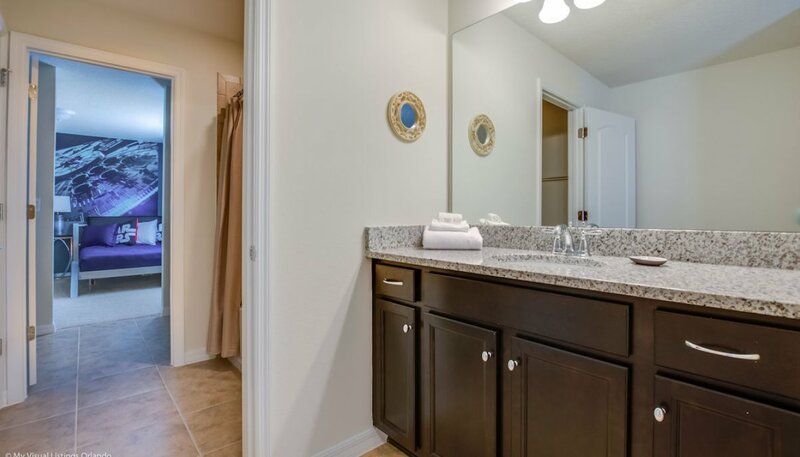 The Jack & Jill bathroom serves both bedrooms 4 & 5 and features a bath with shower over, single vanity with granite counter top either side and WC. 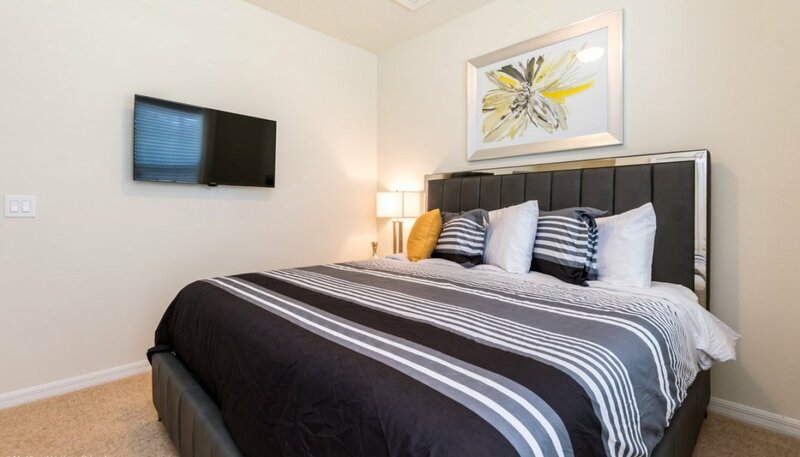 This bedroom comes equipped with a king sized bed with a matching nightstand and chest of drawers with LCD cable TV above and a large built-in wardrobe. 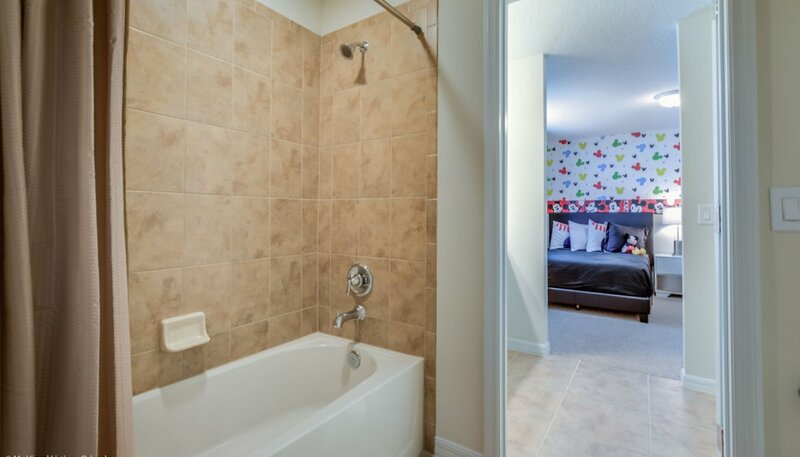 Bedrooms 6 & 7 are served by the remaining family bathroom (between the 2 bedrooms). 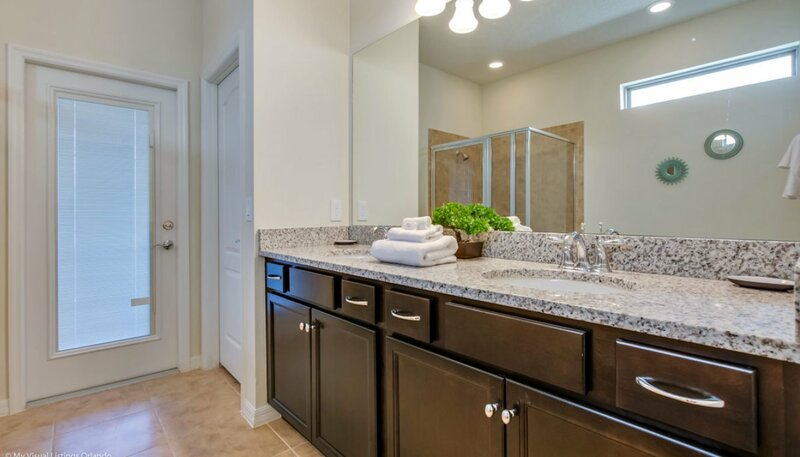 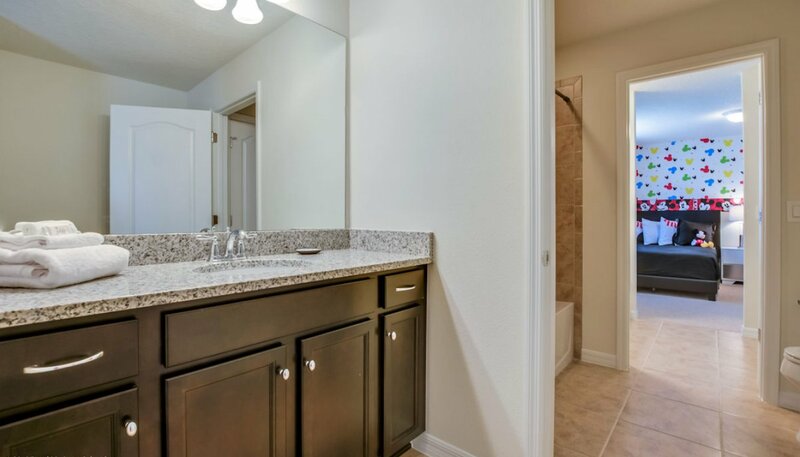 There is a walk-in shower, WC and built-in his & hers sink unit with granite countertop.